Finally, a small profit... but could have been better. Otherwise, after 2 losses, I had 3 winners in a row. That is my longest winning streak since I started reporting trades in the November series. Unfortunately, the points earned in this streak are very low. 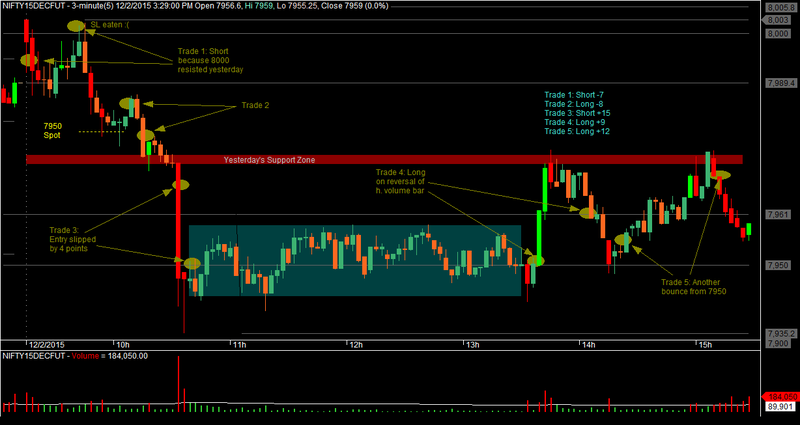 This kind of trading may improve my win %, but will screw up the Payoff Ratio. Details of trades so far are available on the Trading Stats page. Another point that I should focus on is profit taking. On many days, I have had good MFE's, but my profit taking has been lax. Many times, even if I am in a loss, I do not book profit to get my account into green. That's because the only kind of exit that I have used in these trades are leisurely trailing stops. I will have to give this a thought, though I am very uncomfortable with Profit Taking. Also, I do not want to get into the complication of partial booking and adds.